Turkey is an ideal grilling food. From ground turkey burgers and turkey franks, turkey tenderloins and other cuts for the grill, turkey provides you with a wide range of tasty, healthy and convenient meal solutions. During grilling, turkey cooks best by indirect heat on an outdoor covered gas or charcoal grill with a pan of water placed beneath the grilling surface to catch the dripping turkey juices. Turkey breasts, drumsticks, wings and whole turkeys are all suited for grilling. Whole turkeys that weigh 16 pounds or less are the recommended size for safe grilling. However, you will need quite a bit of charcoal or gas for a whole turkey, which can take anywhere from three to four hours to cook on the grill. Do not stuff a whole turkey. Because cooking is at a low temperature, it can take too long for the temperature of the stuffing to reach the required temperature of 165°F. Also, smoked stuffing has an undesirable flavor. Grilling time depends on many factors: the size and shape of the turkey, the distance from the heat, temperature of the coals and the outside air temperature. Estimate 15 to 18 minutes per pound if using a covered grill. Always use a food thermometer. 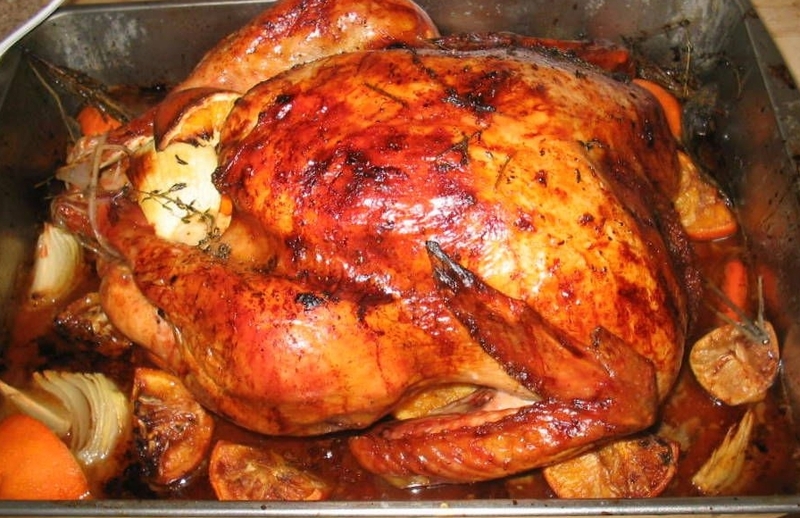 The turkey is done when the food thermometer, placed in the inner thigh, reaches 165-170°F. Keep food safety in mind before preparing any turkey and remember to wash your hands thoroughly with soap and hot water. Hands should be washed again and rinsed along with all utensils, equipment and countertops that have been in contact with any raw food (especially raw poultry) before preparing foods. It’s 20 seconds of prevention that can eliminate 90% of foodborne illness. Grilling a turkey breast is an excellent way to enjoy a turkey dinner without making it a big deal. Prepare a barbecue grill with a rectangular metal or foil drip pan under the grates for indirect cooking. Insert a meat thermometer into the center of the thickest part of a turkey breast, not touching the bone. Place turkey, bone-side down, on the grates directly over the drip pan. Grill turkey, covered, on medium 55 minutes. If using a basting sauce, brush turkey with sauce and continue to grill, covered, 10 minutes. Brush again with sauce; continue to grill, covered, about 10 minutes more or until a thermometer registers 165-170 degrees Fahrenheit. Transfer turkey to a carving board; tent with foil. Let stand 10 minutes before carving. Marinate a boneless turkey breast with olive oil, fresh herbs and garlic for at least 30 minutes or up to 24 hours. Then, preheat a grill to medium high and place a boneless turkey breast, skin side down, on greased grill grates. You’ll want to turn the grill down to medium to avoid burning the skin. After the breast browns, turn it over and cook until the temperature reaches 165-170 degrees Fahrenheit on a thermometer. Slice the turkey and serve on top of salads, with fruit or on your favorite sandwich roll. Turkey tenderloins are the tender long strip of white meat hidden under the turkey breast. Because this strips of meat is an underused muscle of the turkey, it is very tender. One of the best ways to cook turkey tenderloin is with a dry rub and then grill on a hot grill. Combine one tablespoon each of garlic powder, onion powder, dried thyme, sage, kosher salt and fresh ground pepper in a small bowl. Rub this mixture on a turkey tenderloin and wrap in plastic wrap or put in a sealed bag in the refrigerator for at least two hours (overnight is best). Rub grill grates with vegetable or canola oil and preheat the grill. Place the seasoned turkey on the grill and cook five minutes on each side. Check the temperature with a meat thermometer to make sure the temperature is 165 degrees F. Take the turkey off the grill and let rest for five minutes to let the juices rest back into the meat. Rub turkey legs with a mixture of chili powder, cumin, garlic and oregano. Season with salt and pepper and let rest several hours to allow the flavors to develop. Be sure to grill turkey legs over a medium-low heat for tender crispy results. In the end, you’ll be able to pull the meat right off of the bone and enjoy as is, with your favorite salsa or smothered with spicy BBQ sauce. How to avoid parched pucks. Season ground turkey with your favorite herbs and spices. Since ground turkey is lower in saturated fat than ground beef, you need to add olive oil or another liquid to the mix to make a juicy healthy burger. Make sure to place burgers on a well-greased, preheated grill to prevent sticking. Cook over medium-high heat until cooked all the way through to 165-170ºF. Grill some onion slices and peppers on the side and you’ll amp up the flavor even more. Combine rosemary, garlic and olive oil in a small bowl. Rub all over the turkey breast, then season liberally with salt and pepper. Cover and refrigerate overnight. Place a heatproof drip pan beneath the grill grates on one side of the grill and preheat to medium. Turn off the side of the grill with the drip pan. Pour about 1/4 inch of water into the drip pan, then place the turkey on the grill over the drip pan, skin-side facing up and cook over indirect heat, covered, at about (375-400°F) for 30 minutes. Check to make sure there is still water in the pan and add more if necessary. Also, check that the grill temperature has remained constant and adjust accordingly. Continue cooking for 35-45 minutes, then check temperature of the turkey. When turkey reads 165-170°F on a meat thermometer it is cooked through. Transfer to cutting board to rest for 15 minutes, then slice and serve. This recipe uses a combination of direct and indirect heat, which can be accomplished using a charcoal or gas grill. If you have a gas grill, you can easily use it to roast the peppers. Roast peppers on the grill over high heat, turning with tongs, until skins are blackened, 5 to 8 minutes. (Alternatively, broil peppers on rack of a broiler pan about 5 inches from heat, turning occasionally, about 15 minutes.) Transfer to a bowl and let stand, covered, until cool enough to handle. Peel peppers and discard stems and seeds. Chop peppers and pat dry. Finely grate 2 teaspoons zest from the lemon and squeeze 2 teaspoons juice. Puree zest, juice, mayonnaise, garlic and the 1/3 cup chopped basil in a food processor until smooth and season with salt and pepper. Transfer to a bowl and chill, covered, while preparing roulades. Remove and discard skin from the turkey breast, Cut turkey breast in half crosswise and chill 1 piece, covered, while working with the other. Holding a sharp knife parallel to the work surface and beginning on a long side, butterfly turkey by cutting horizontally almost in half (not all the way through), then opening it like a book. Place between 2 sheets of plastic wrap and, with flat side of a meat pounder, pound turkey to slightly less than 1/4 inch thick. Butterfly and pound remaining piece of turkey. Season turkey pieces well with salt and pepper and divide roasted peppers between them, spreading evenly and leaving a 1/4-inch border around edges. Top peppers with whole basil leaves and sprinkle with cheese. Beginning with a short side, roll up each turkey piece, gently pressing on filling while rolling (don’t roll too tightly, or filling will slip out of the ends) and tie roulades crosswise with string. Season roulades with salt and pepper. If using a charcoal grill, light a full chimney of charcoal and place on one side of the grill. Charcoal will be ready for cooking when it turns grayish white, 10 to 15 minutes. If using a gas grill, light all burners. When fire is medium-hot (you can hold your hand 5 inches above rack 3 to 4 seconds), place roulades on lightly oiled grill grates directly over the fire and grill, uncovered, turning occasionally, until seared on all sides, about 15 minutes. If using a gas grill, turn off 1 side of the grill. Move roulades away from the fire and grill over indirect heat, covered, turning roulades occasionally, until an instant-read thermometer inserted diagonally 2 inches into several places on each roulade registers 165-170°F, about 15 to 20 minutes. Transfer to a cutting board and let stand 10 minutes. Discard string, being careful not to unroll turkey, and cut into 1/2-inch-thick slices with a serrated knife. Serve roulades with sauce. Turkey legs, seasoned with smoky, sweet-flavored barbecue sauce, taste delicious when prepared on the grill. Instead of worrying about the turkey legs sticking to the grill, cook them covered in aluminum foil. Keep the turkey legs moist in the foil by basting the meat on a regular basis with your favorite BBQ sauce. To improve flavor, brining is an important first step for turkey legs. In a large bowl or pan, combine the water, salt, brown sugar and liquid smoke. When salt and sugar have dissolved, add the turkey legs. Cover and refrigerate for 24 hours. Drain brine from turkey legs, discard the brine and gently pat turkey dry with paper towels. Preheat the grill to medium. The temperature should read between 325 and 350 degrees Fahrenheit on a charcoal or gas grill. To brown the skin and lock in flavor, sear each turkey leg on the grill on direct heat for approximately two minutes on each side. Baste each turkey leg with a generous amount of barbecue sauce. Make your own or use a commercial brand. Wrap each turkey leg loosely in foil. Avoid tightly covering the drumsticks, since this can prevent heat from circulating properly around the meat. Cover the grill and cook the turkey legs for approximately one-and-a-half hours. Baste them with barbecue sauce every 20 to 30 minutes to keep the drumsticks moist. Check the internal temperature to determine when the meat is cooked thoroughly. The meat thermometer should read 165 degrees Fahrenheit before you remove the turkey legs from the grill. Then add more barbecue sauce, rewrap the legs in the foil and allow the turkey legs to rest for 30 minutes before serving them. One way to keep the turkey moist is to add milk and lightly mix them together. Overhandling the meat can make tough burgers. Heat olive oil in a large, heavy skillet over high heat. Add onions; stir-fry onions 2 minutes. Reduce heat to medium-low; cook, stirring often, until soft and starting to caramelize, about 15 minutes. Stir in barbecue sauce; cook 1 minute. Remove from heat. Cover; keep warm. Meanwhile, prepare a grill for medium-high heat. Lightly mix turkey, milk, parsley, paprika, salt and pepper in a large bowl; form into 4 patties. Grill until cooked through, turning once, about 8 minutes total. Place on buns and top each with onions. Season tenderloins with garlic powder, salt and black pepper. In a medium bowl, whisk together all marinade ingredients. Place the tenderloins in a large plastic storage bag. Pour marinade over tenderloins and coat well. Seal bag and refrigerate 1 hour or overnight. Oil grill and preheat to medium-high. 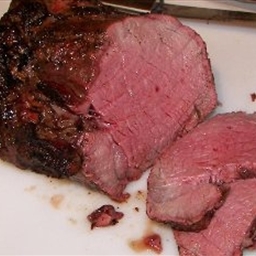 Remove tenderloins from marinade and discard the marinade. Grill tenderloins turning frequently, about 25 minutes or until done and the internal temperature reaches 165 degrees F.
While turkey is grilling prepare salsa. In a small bowl, combine all ingredients and mix well. 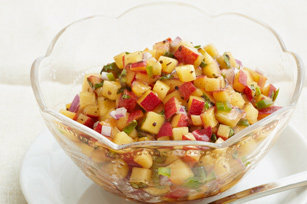 Slice the tenderloins into about 3/4-inch slices and spread peach salsa evenly over tenderloins. What Should I Do With The Leftovers ? Now that the holiday dinners and festivities are over, it is time to get back to the normal routine. After all the rich food, it is time to eat more simply and more healthfully. After the hectic pace of the holiday season, it is time to move at a slower pace. Now what about all those leftovers from the holidays in your refrigerator or freezer? What can you do with them that won’t be tons of work and, at the same time, healthy? Instead of tossing those holiday leftovers to avoid more over-indulging, use them to your advantage. Here are some practical tips and recipes to help you reduce food waste and space out the calories. Most foods will stay fresh for up to seven days, but if it looks or smells even a little funky, throw it out! Serve small portions of leftover turkey, roast beef or ham along with lots of fresh fruits and vegetables for sandwiches, salads, wraps or a light main course. Mix leftover veggies and seafood with small portions of pasta or brown rice. Reduce portions of high calorie favorites by adding fresh or frozen vegetables to creamy soups, rich pastas or leftover mashed potatoes. Combine herbs and roasted root vegetables along with a pinch of low fat cheese to make quesadillas, minis pizzas or omelets. Toss leftover cookies in the work bowl of a food processor and pulse those gingerbread folks and sugary stars into tiny crumbs. Put them in ziplock bags and freeze for up to two months. Use the sugary mixtures to make a pie crusts, a base for bar cookies or toppings for cobblers. You can pulverize candy canes and use the bits and peppermint dust to flavor ice cream treats for months to come. Sprinkle the candy mixture on top of vanilla ice cream or frozen yogurt. 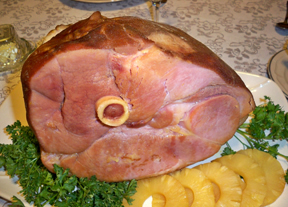 Cut the holiday ham or pork roast into small pieces or cubes and use to make quick frittatas or stir-fries. If a turkey or a beef roast was the centerpiece at your Christmas table, shred the leftover meat and add to your favorite chili mixture. Freeze in containers that hold from 4 to 6 cups, and you’ll have a quickie dinner to thaw and serve in January. Serve with good rye bread and a salad for a quick weeknight meal. In a 3 quart saucepan, saute ham, onion and garlic in oil until onion is tender. Add the next seven ingredients; cover and simmer for 30 minutes or until vegetables are tender. Add peas and cook for 5 minutes. Add parsley and serve. Cook pasta according to package directions. Meanwhile, in a small saucepan, combine flour and milk until smooth. Bring to a boil; cook and stir for 2 minutes or until thickened. Remove from the heat; set aside. In a large nonstick skillet, saute the mushrooms, onion and green pepper in oil until tender. Reduce heat; add the ham, 1/2 cup Swiss cheese and Parmesan cheese. Cook and stir until cheese is melted. Remove from the heat. Stir in 1/2 cup of the reserved sauce. Drain pasta; stuff each shell with about 3 tablespoons of filing. Place in a 13-in. x 9-in. baking dish coated with cooking spray. Top with remaining sauce. Cover and bake at 350° F. for 30 minutes or until heated through. Sprinkle with parsley, paprika and remaining Swiss cheese. In a large saucepan, melt butter. Stir in flour until smooth; gradually add milk. Bring to a boil; cook and stir for 1-2 minutes or until thickened. Remove from the heat. Add cheeses; stir until melted. Place vegetables in a 2-qt. baking dish coated with cooking spray; sprinkle with ham. Pour sauce over ham. Place bread crumbs in a small bowl; spray with butter-flavored spray. Sprinkle around the edge of casserole. Bake, uncovered, at 350° F for 25-30 minutes or until heated through and bubbly. Cut the meat in slices about 1/3 inch thick, then the slices into strips 2 1/4 inches long. You should have about 4 cups. Set aside. Heat the broth in a small saucepan until hot. Melt the butter in a large skillet over medium heat. Add the onion and cook until softened but not brown, stirring frequently, about 3 minutes. Increase the heat to medium-high and add the mushrooms. Cook until the mushrooms become tender and start to release their juices, stirring frequently, 5 minutes. Add 6 to 8 grinds of black pepper and stir. Sprinkle in 1 tablespoon of the flour and cook for 1 minute, stirring occasionally. Do not brown. Add the hot broth and stir until smooth. Add the beef to the pan, stir well, and warm just to a simmer, about 3 minutes. Stir the remaining 1 teaspoon of flour into the sour cream, add to the pan and season with salt to taste. Warm gently over low heat until hot, about 7 minutes. The sauce will thin a little; do not boil or the sour cream will break up. Spoon over the noodles. Serve with a green vegetable. Remove leftover roast and trimmings from refrigerator. Skim off all the visible saturated fat (hard white fat that rises to the top when chilled). Place roast beef on cutting board. Using a sieve, strain the liquids into a bowl, removing any solids and additional fat solids. Chop onion and green pepper into 3/4-inch pieces. Dice beef into 1 1/2-inch pieces or shred the roast beef . Quarter the potatoes and slice carrots. In a dutch oven or pot over medium-high heat, saute onions in olive oil for 3 minutes, then add green pepper and saute for 3 minutes more. Add beef, strained beef stock, diced tomatoes, potatoes, carrots, oregano, basil, celery salt, and thyme. Reduce heat to low and simmer for 30-45 minutes, stirring occasionally. Taste for seasoning, and add salt and pepper if desired. Add whole mushrooms just long enough to heat through. Serve hot. Note: If you have leftover potatoes, green beans, peas, or carrots, feel free to use those. Since they are already cooked, add those with the mushrooms just long enough to reheat. Lightly grease a 2-quart baking dish. Heat oven to 350°F. In a large skillet over medium heat, sauté the onion in the olive oil until softened and lightly browned. Add beef and sauté for about 1 minute longer. Stir in the flour until blended. Add beef broth, Worcestershire sauce, and peas and carrots. Add salt and pepper to taste. Spoon into the prepared baking dish. If using leftover mashed potatoes, warm them in a saucepan with a little milk until softened. Spoon potatoes evenly over the beef layer and sprinkle lightly with paprika. Bake for 25 to 35 minutes, until hot and bubbly. If desired, turn on the broiler to brown the top for just a minute or two, but watch carefully to prevent burning. Bring broth to a simmer in a medium pot over medium heat. Reduce heat to low. Cover and keep warm. Meanwhile, melt 1 tablespoon butter in a large pot over medium heat until it begins to foam. Add onion. Sauté, stirring occasionally, until onion is soft and translucent and just beginning to turn golden, about 5 minutes. Add mushrooms; cook, stirring occasionally, until soft, and any liquid released has evaporated, 5-7 minutes. Add rice; stir to coat. Add 1/2 cup warm broth and stir constantly until liquid is absorbed. Continue adding stock by 1/2-cupfuls, stirring constantly, until rice is tender but still firm to the bite, about 20 minutes. Add leftover turkey meat, stir to combine and to warm through, adding a little stock or water if necessary to keep mixture creamy, about 3 minutes. Stir Parmesan into risotto. Season to taste with salt and pepper. Divide among warm bowls. Garnish with chopped parsley. Spread pesto on bread. Top 1 bread slice with turkey, bacon, lettuce, tomato, and remaining bread slice. This traditional Roman dish is classically made with veal but can also be made with turkey. Sprinkle each cutlet lightly with salt and pepper. Top with a slice of prosciutto and a sage leaf. Place cutlets between 2 sheets of parchment, waxed paper or plastic wrap. With a mallet or rolling-pin, gently pound cutlets to an even 1/4-inch thickness, pounding the prosciutto and sage into the cutlets. Spread the flour on a shallow plate and dip the cutlets in it, lightly coating both sides. Heat a tablespoon of butter and the olive oil in a large pan. When the butter begins to foam, add the cutlets to the pan, prosciutto side down. Cook 3 to 4 minutes per side, turning once, until lightly browned and cooked through. Transfer to a platter and cover to keep warm. Add wine to the hot pan and stir with a wooden spoon to loosen all the brown bits from the bottom of the pan. Let the wine reduce by half, then add the chicken broth and reduce again. Remove the pan from the heat and swirl in remaining tablespoon of butter. Taste and adjust seasoning with salt and pepper, then pour over the reserved cutlets. Serve immediately with lemon wedges. Bring a 6-qt. pot of salted water to a boil. Add pasta; cook until al dente, 8–10 minutes; reserve 1 cup pasta water and drain pasta. Meanwhile, heat oil in a 12″ skillet over medium heat until shimmering. Add pepper; cook until fragrant, 1–2 minutes. Ladle 3⁄4 cup pasta water into skillet; bring to a boil. Using tongs, transfer pasta to skillet; spread it evenly. Sprinkle the Pecorino Romano cheese over pasta; toss vigorously to combine until sauce is creamy and clings to the pasta without clumping, about 2 minutes, adding some pasta water if necessary. Transfer to serving bowl. Bring a large pot of water to a boil. When the water comes to a boil, salt generously and add the green beans. Boil for four minutes, then drain and dry on a kitchen towel. Mix together the parsley, lemon zest and almonds in a small bowl. Heat the oil over medium heat in the same pan used for the green beans and add the garlic. As soon as it begins to sizzle, stir in the beans. Toss for about a minute until the beans are coated with oil and cooked garlic, then stir in the parsley mixture. Stir for a minute, and season to taste with salt and pepper. Transfer the beans to a platter or serving dish, scrape the almond mixture remaining in the pan over the top and serve. 1. Prepare the Tomato Vinaigrette. Keep the vinaigrette warm. 2. Lay the turkey between two pieces of waxed paper, and flatten each cutlet with the flat end of a mallet until thin. 3. Heat the olive oil in a large, nonstick skillet until hot. Season the cutlets with salt and pepper and dredge it in flour. Sauté the turkey over high heat, about 1 minute on each side. Remove to a warm platter and serve, topped with the vinaigrette. Place the tomatoes, vinegar and salt in a saucepan. Bring to a boil and reduce the mixture to a thick consistency, about 5 minutes. Remove from the heat, place the sauce in a glass container and cool over ice. Place the mustard and lemon juice in a food processor. With the machine running, add the basil and olive oil. Add the cooled tomato mixture and puree until smooth. The vinaigrette can be stored in the refrigerator for 1 week. Peel the potatoes and slice them as thinly as possible, about an 1/8 inch thick. Put the sliced potatoes in a large bowl of cold water to keep them from browning. Cut the fennel in half lengthwise. Slice the fennel crosswise as thinly as possible, about an 1/8 inch thick. You should have about 4 cups. In a another bowl, combine the breadcrumbs, cheese, parsley, and garlic. Mix well with your hands, making sure the garlic is evenly distributed. Position a rack in the center of the oven and heat the oven to 400ºF. Lightly spray the bottom and sides of a 9×13-inch baking dish with olive oil cooking spray. Season with 1/2 teaspoon of the salt and a couple of grinds of the pepper. Sprinkle the potatoes evenly with 1/4 cup of the breadcrumb mixture. Drizzle with 1 tablespoon of the oil. Top the potatoes with half of the sliced fennel, spreading it evenly. Sprinkle the fennel with 1/2 teaspoon salt, 1/4 cup of the breadcrumb mixture, and 1 tablespoon of the oil. Repeat this layering process, ending with a top layer of potatoes. Season the top layer with the remaining 1/2 teaspoon salt and some more pepper. Mix the remaining breadcrumb mixture with the final 1 tablespoon oil and sprinkle over the top of the casserole. Cover the dish tightly with aluminum foil and bake for 40 minutes (be sure the aluminum foil is sealed tightly all around the baking dish, or there won’t be enough steam to cook the potatoes). Uncover and continue baking until the potatoes are tender when pierced with a fork and the top is golden brown, 25 to 30 minutes longer. Let rest at least 10 minutes before serving. While the fennel potato casserole is resting, cook the asparagus in the broiler as described below. Take 1 bunch of asparagus and cut off the tough ends. Wash lightly and let dry completely. Place asparagus on a cookie sheet or the bottom of a broiler pan. Drizzle with 1 tablespoon of olive oil and sprinkle with salt and pepper. Move oven rack to the top and turn broiler on low. Cook for 5-10 minutes depending on thickness. Heat oil in a saute pan over medium heat. Season turkey with chopped sage, salt, and pepper. Cook turkey in pan 2 1/2 minutes per side. Arrange peppers and cheese on top of turkey and pour Marsala and broth to pan. Place the lid on the pan and cook 45 seconds or until cheese is melted. Using a slotted spoon, remove turkey cutlets to a plate and keep warm. Let Marsala mixture boil about 1 1/2 minutes or until liquid is reduced to 1/3 cup. Take pan off of heat and whisk in butter. Place turkey cutlets over pasta on serving plates and spoon sauce over turkey. Sprinkle with chopped sage. Seed red bell pepper and cut into quarters. Lay pepper quarters, flesh side down on a foil covered baking sheet; broil 10 minutes or until skin is black. Put peppers in a plastic bag and let rest, sealed for 10 minutes; peel off skin. In a small bowl combine the bread crumbs and cheese. Put the broccoli in a large bowl, add the egg substitute and toss with your hands to coat. Sprinkle in the bread crumb and cheese mixture and toss to combine. Transfer to a baking sheet, flat side down, and roast for 12 minutes. Pat the turkey with paper towels to dry and ensure even browning. Season the turkey with salt and pepper. Dredge the turkey in the flour to coat. In a heavy roasting pan large enough to fit the turkey thighs in a single layer, heat the oil over medium heat. Add the turkey and cook until brown on both sides, about 6 minutes per side. Transfer the turkey to a bowl and reserve. In the same pan, add the onion, carrot, and celery. Season vegetables with salt. Cook until the vegetables are tender, about 6 minutes. Stir in the tomato paste and cook for 1 minute. Stir in the wine and simmer until the liquid is reduced by half, about 3 minutes. Return the turkey to the pan. Add enough chicken broth to come 2/3 up the sides of the turkey. Add the herb sprigs and bay leaves to the broth mixture. Bring the liquid to a boil over medium-high heat. Remove the pan from the heat. Cover the pan tightly with foil and transfer to the oven. Braise until the turkey is fork-tender about 2 hours, turning the turkey after 1 hour. Heat the broth and water ( total 6 cups) in a pot and keep warm. In a heavy Dutch oven pan, heat 1 tablespoon of the butter and the oil and cook the shallot over medium heat until it is translucent. Add the wine, and cook over medium heat until the wine is almost absorbed. Reduce the heat to medium low, and add 5 cups of the hot liquid. Cook for 18 minutes stirring just twice during this period or until the rice is just al dente. Add 1/2 cup of broth and stir constantly for 3 minutes until the rice is creamy, adding remaining broth if risotto isn’t loose enough. To finish the dish add the Parmesan cheese, lemon juice, remaining butter and salt and pepper to taste. Mix well. Defrost 1 package of frozen green peas but leave them in the plastic bag that encloses them. Heat in the microwave on high in the bag for 3 minutes. Pour into a serving bowl and toss with 1 tablespoon extra-virgin olive oil and fresh cracked black pepper. This recipe can be cut in half to make 4 servings. However, this is a good choice for an entrée when entertaining an would want to make the full amount. Combine 2 cups boiling water and porcini mushrooms in a bowl; cover and let stand for 15 minutes or until the mushrooms are soft. Drain through a sieve over a bowl, reserving soaking liquid. Chop the porcini mushrooms. Heat a large nonstick skillet over medium heat. Add 1 1/2 teaspoons olive oil to pan, and swirl to coat. Coarsely chop 1 pancetta slice. Add chopped pancetta to pan; cook for 3 minutes, stirring occasionally. Add 1 3/4 cups shallots, 2 teaspoons rosemary, 1/4 teaspoon salt, and 1/4 teaspoon pepper; cook for 7 minutes or until shallots are tender, stirring occasionally. Stir in reserved mushrooms. Cool slightly. Slice 1 turkey breast half lengthwise, cutting to, but not through, the other side. Open halves, laying turkey breast flat (like a book). Place plastic wrap over turkey breast; pound to 1/2-inch thickness using a meat mallet or small heavy skillet. Spread half of shallot mixture over turkey breast; roll up jelly roll fashion, starting with long sides. Sprinkle with 1/4 teaspoon salt and 1/4 teaspoon pepper. Arrange 4 pancetta slices evenly on top of turkey roll. Secure at 2-inch intervals with twine. Repeat procedure with remaining turkey breast half, shallot mixture, 1/4 teaspoon salt, 1/4 teaspoon pepper, and 4 pancetta slices. Heat a large Dutch oven over medium-high heat. Add remaining 1 1/2 teaspoons oil to pan; swirl to coat. Add turkey rolls to the pan; cook 6 minutes or until browned, turning after 3 minutes. Add remaining 1/4 cup shallots, carrot, celery, and wine to pan. Bring to a boil; cook until liquid is reduced by half (about 2 minutes). Stir in reserved porcini liquid and remaining 2 1/2 teaspoons rosemary. Cover and bake at 325° for 40 minutes or until a thermometer inserted in thickest portion registers 160°. Remove turkey rolls from pan; let stand 15 minutes. Cut each roll crosswise into 12 slices. Strain cooking liquid through a fine mesh sieve over a bowl; discard solids. Combine 1/4 cup water and flour, stirring with a whisk until smooth. Return remaining cooking liquid to pan; add flour mixture and remaining ¼ teaspoon salt, stirring with a whisk. Bring to a boil; cook 1 minute or until thickened, stirring constantly. Serve sauce with turkey slices. Freshly coarsely ground cracked black pepper. 1. Bring a pot of water to a boil and add salt, just as you would to cook pasta. Add rice and stir. When water returns to a boil, lower heat and cook rice until tender but not mushy, about 15 minutes, stirring occasionally. Drain in a fine mesh colander or line your colander with cheesecloth if the wholes in your colander are large enough for the rice to fit through. 2. Put butter in the same pan and turn heat to medium. When butter melts and just begins to turn brown, add rice and toss together. Stir in Fontina cheese, the Parmesan, along with freshly ground cracked pepper. Halve the tomatoes crosswise (through the equator, not from stem to bottom). Place the tomatoes flesh-side up on the prepared pan and brush the tops with the olive oil. Season the top of each tomato with salt and freshly ground black pepper. Combine the Parmesan cheese and garlic and mix well to combine. Sprinkle the mixture on the top of each tomato. Broil 5 to 7 minutes, until the tops are golden brown and tomatoes soften. Sprinkle the parsley over top just before serving. How Many Ways Can I Make Scallopini? When I was growing up, veal dishes were on our dinner table regularly and I know I did not even think about where veal came from in those days. My father would go to the butcher shop and bring home a couple of pounds of veal cutlets, proclaiming “how beautiful they were”. My mother usually breaded and fried the veal in oil; the basis for veal parmesan. We usually just ate it as fried cutlets but occasionally with tomato sauce. Most of the Parmesan style dishes are not found in Italy but have developed, over the years, into Italian-American cuisine. In the first few months of my marriage, I decided to experiment with one of the veal scallopini dishes from my Ada Boni book. I made the Veal Scallopine with mushrooms and wine. My husband loved it; so I added it to my recipe box. Shortly after, we invited my in-laws for dinner and my husband wanted me to make this dish. I knew his mother liked Italian food but I wasn’t sure about his father. I asked what he liked to eat and my husband said he was “a meat and potatoes man”. I thought, well, this will work. I always served it over pasta with 2 small cutlets per person, but I made a little extra that day and thought “just in case”. When we sat down at the table for dinner, we passed the serving plates and my father-in law said he didn’t eat pasta. I said to my self, UH OH, as he proceeded to take several helpings of the veal and said , “it wasn’t bad.” I was glad I made enough pasta for the rest of us. Scallopine is an Italian dish made with thin ¼ inch slices of meat (traditionally veal) that are pounded with a mallet to approximately 1/8 of an inch. The veal used is generally taken from a muscle and is cut across the grain and trimmed of any fat. This makes veal scallopine a very low calorie cut of meat. Scaloppine is a fairly quick dish to prepare, since the thin slices of meat require very little cooking time. The classic veal scallopine is often dredged in flour with a few Italian herbs, salt and pepper, and then cooked in a skillet in oil and butter. There are a few traditional additions, such as capers and parsley and sometimes cooked mushrooms. White wine is added to the pan, once the meat is removed, to make a light sauce. If lemon juice is added to scaloppine dishes then the dish would be called piccata. Adding Marsala wine to scaloppine dishes is traditionally referred to as Veal Marsala. 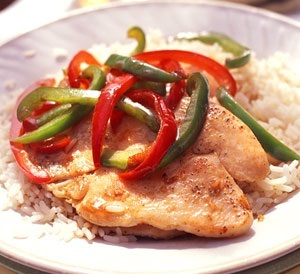 Using chicken or turkey breasts instead of veal can further reduce the fat content of veal scallopine; and if you reduce the amount of fat you cooked the meat in, you will have a healthy entree. 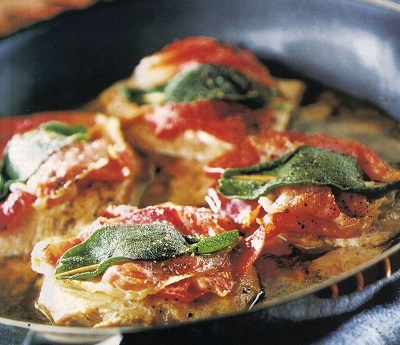 Scallopini dishes are good quick fix dinners for busy weeknights. 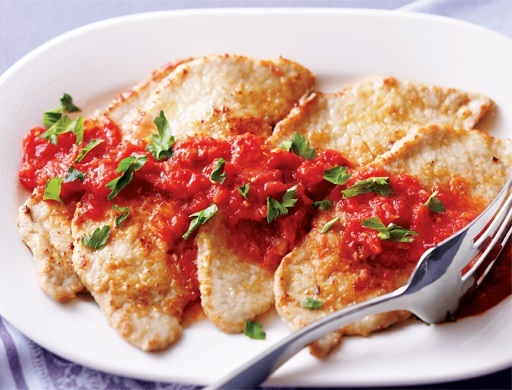 I know that veal is the traditional type of meat used in scallopini dishes in Italian cuisine but I prefer to use chicken, turkey, pork or fish in my recipes. Animals were once confined to limit their movement; hence, the meat would be more tender and pale. In the past, Milk-fed veal came from calves up to 12 weeks old that had not been weaned from their mother’s milk, but veal of this quality is rare in today’s supermarket. Animal rights activists made the public aware of such practices in the 1980s. For that reason, the consumption of veal was a source of controversy. In recent years, veal producers have attempted to make their system of production more humane. Today, shoppers are more likely to find calves fed a nutritionally balanced milk or soy-based diet that is fortified with essential nutrients. Many producers of veal are committed to animal friendly housing and humane treatment of their animals. The calves feed on a combination of milk and nutrient rich grains free of antibiotics. New facilities in America sometimes surpass strict European humanely raised standards. While the old veal was white and bland, the new veal is pink and flavorful. Although veal is supposed to be leaner and more tender than beef, not all veal is made equally, and not all cuts carry the same level of quality. According to the website, Organic: Love to Know, “A good way to tell if veal is humanely raised is simply by looking at it. If it’s pink, that most likely means the calf had an adequate supply of iron.” They conclude that this pink veal is sometimes called Meadow, Rose, Pastured, Free-range, and Grass-Fed. The New York Times adds that you should look for the label “certified humane. ”These “Certified Humane” calves are now given abundant space free from harsh weather and given good, dry bedding. Furthermore, calves are kept in small groups with others of similar size and age, allowing each to receive the full care from the veterinarian or the farmer. The pinker the meat, the older the animal was at slaughter and, therefore, the meat may be tougher and stronger-flavored. If the meat is a reddish tone but still marked as veal, it may be a calf between 6 and 12 months and should more appropriately be called baby beef. Or, the calf may have been allowed to eat grains or grasses, which also darken the meat. The choice is yours. Anything you can make with veal, you can make with chicken, turkey, fish or pork. I will describe below the different preparations for the type of meat or poultry that you choose to use. To prepare the cutlets, you will need is a meat mallet with a smooth side. The flouring process is quite important. The flour helps brown the meat, but also lends more texture to any sauce produced at the end. Without flour, the addition of canned tomatoes or fresh tomatoes is likely to result in a watery sauce. In the wine deglazing process of a traditional scallopine dish, the collection of flavorful bits that accumulate in the middle of the pan while cooking the meat, is made easier when the meat is flour coated. To serve four, start with four 6-ounce boneless and skinless chicken-breast halves. Cut each breast crosswise on the bias into two equal pieces. Place the pieces between two sheets of plastic wrap and pound them with the smooth side of a meat mallet to a thickness of about ¼ inch. Proceed with the recipe. To serve four, start with eight 3-ounce slices of boneless pork tenderloin completely trimmed of fat. Place the slices between two sheets of plastic wrap and pound them several times with a meat mallet to a thickness of about ¼ inch. Proceed with the recipe. To serve four, start with eight 3-ounce turkey cutlets. (Most turkey cutlets are sold pre-cut in supermarket meat cases; if not, use boneless turkey breasts and cut then into slices and come as close as you can to these weights.) Place the slices between two sheets of plastic wrap and pound them with the smooth side of a meat mallet to a thickness of about 1/ 4 inch. Proceed with the recipe. Fish is not pounded, so buy thin fillets (4 small white fish fillets (such as tilapia, flounder or sole), about 1 pound total). Salt & pepper the fish. Put them into a shallow dish and cover with milk. (Soaking in milk helps to freshen the fish). Set aside. Lift out of milk and proceed with the recipe. Use a small skillet that fits 2-3 cutlets at one time. This way very little fat will be needed. It is better to repeat the process with a second batch of cutlets. Cutlets are removed to a dish to be kept warm and the sauce is made in the pan after the cutlets are removed. The sauce is then poured over the cutlets on the serving platter. Season the scallopine with salt and pepper. Dredge in flour to coat both sides lightly and tap off excess flour. Heat 1 tablespoon olive oil in a small skillet. Cook the cutlets until golden brown on the underside, about 3 minutes. Flip and cook until the second side is lightly browned, about 2 minutes. Remove to a platter and cover with foil. Repeat with remaining scallopine. If you like the taste of Marsala, you can use that instead of white wine. You may like red wine in the sauce for pork scallopini. If you like the taste of lemon, you can add 1 tablespoon of fresh lemon juice. The resulting dish is called Piccata. Double the ingredients if you are making 6 cutlets. Add all the sauce ingredients to the skillet, except the parsley. Bring to a boil, reduce heat and simmer about 30 seconds. Pour sauce over cutlet that are on the platter and sprinkle with parsley. I like to serve scallopini with a green vegetable.